The days before Eid-ul-Azha are full of fervour as both, the young and the old, visit cattle markets set up in their respective cities and villages to buy sacrifice animals of their choice. One hindrance, like previous years, is the price hike, not just for the buyers but for the vendors as well. The largest cattle market in Asia, located along Super Highway in Karachi, is now open and is bustling with all varieties of animals. The market was inaugurated in a colourful opening ceremony on Wednesday. With over 70,000 cattle already present at the market – which is spread over 26 blocks and 800 acres of land – even more vendors are coming from all parts of the country to sell their cattle. ‘VIP’ animals worth more than Rs 1 million are placed in 30 VIP tents. 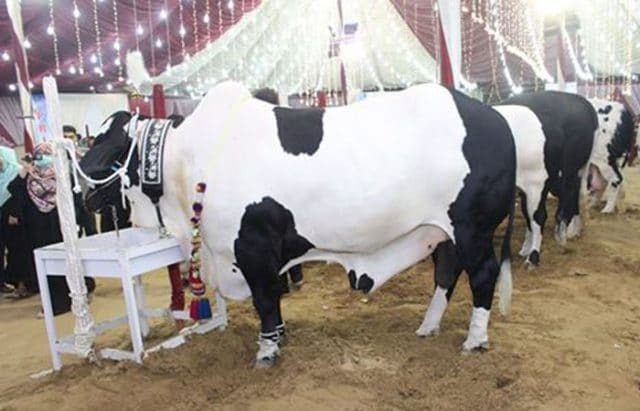 Big names in the cattle industry like Sindh Dairy, Afridi, Dilpasand, Surmawala, Kainat, Jinnah Cattle etc. have displayed their cattle in these tents. The market supervisor Malir Cantonment hires a private firm for administrative control, which was awarded to Hasan Brothers this year after a tender. Syed Irshad Ahmed is the market administrator, nominated by Hasan Brothers, to monitor the proceedings. The main issue faced by the sellers is the entry fee for animals, which has been increased after five years to Rs. 800 from Rs. 600 for each sheep and goat, and Rs. 1400, up from Rs. 1000, per animal for cows and bulls. With the increase in the entry fee, we will also have to increase the price of our animals. However, the customers will not understand that. An increase of Rs. 400 per animal may not matter much to those who bring few animals but for those traders who bring hundreds of animals, the price hike is not affordable. Murtuza Taili from Hyderabad said that he had faced several issues the last time around – his cattle fell ill, there was less turnaround, and rains made the situation worse because it was not handled well by the administration, but he hopes that the administration is better prepared for such issues. Talking about the facilities, an administrator told that they’re offering 16 litres of water per animal, toilets for traders, free electricity, ambulance a fire tender and round-the-clock veterinary services via 12 veterinary doctors and para-veterinary staff at the market. It is our prime responsibility to keep the Asia’s biggest cattle market safe for both the customers and sellers, which is why we are ensuring the health of all animals. A[ wahan kia kam krty hain by the way? Aap ko shayad Parking Ticket wala Budha Baba nahi takraya. Jo log Janwar lagatay hain bhai woh wahin khatay hain. Aur food Prices zyada hongay to woh sab in the end Janwar ke price ke shamil hojata hai. Lagay hoay hotay hain bhai waisay setup wahan. beech beech main. Khana bus mehanga hota hai. Kha chuka hon kaafi dafa , pait strong ho aap ka to kabhi try keejiayga. bhai jb app log eid ke shopping karnay jatay ho to kia wahan kuch khatay nahi ho? Salman bro ,, aap shopping krnay jaatay hoto wahan janwar ki smell,, or nuqsan krnay wali beemaariyan nahi hoti jabkay mandi main kaafi beemariyan hoti hai to agr aisa hai piyas lagti hai bhook lagti hai zahir hai insan hain to apna lekar jaao,, beemariyan hoti hain agr aas pas janwar hon toh,, tea tak nahi peeni chahiye aisi jagah pay.